​MANY people have a Bible in the home; some carry one to church on Sundays, perhaps as a matter of outward show, possibly in some cases considering it somewhat in the nature of a fetish or an amulet to protect them against evil—but how many spend much time in reading, examining or really studying it carefully and unbiasedly? We are reminded of the farmer who entertained a preacher at his home. At the dinner table a question came up and the preacher gave the answer from the Bible. The farmer asked in astonishment, "Is that in the Bible?" The preacher replied, "Yes. Let me see your Bible and I will show it to you." The farmer sent his boy into the front room to get the family Bible. The boy called back, "Which is the Bible?" The father replied, "Why, you know; it's that book we use so much." The boy came back with the mail order catalog! One often hears it said that the Bible is too deep and too difficult for the average person to understand; and too often such reasoning becomes the excuse for laziness in its study, or for not studying it at all. Furthermore, some become discouraged because of so many conflicting creeds and so many disagreements between various sectarian church heads, preachers and writers as to what the Bible really teaches; they feel that if various theologians, who have gone through much schooling, cannot figure it out and agree as to its correct meaning, there is little hope for them to do so. Others care little about learning of the wisdom of God as contained in His Word, for they are indifferent, seeking after earthly wealth and honors, and often are "lovers of pleasures more than lovers of God" (2 Tim. 3:4). However, we should recognize that the all-wise, all-just, all-loving and all-powerful Creator, who has given His human creatures the capacity for understanding a written revelation, would surely provide for them some such revelation of His purposes and plans for them. The Bible, the oldest book in existence, claims to be that revelation; and if one reverently, humbly and earnestly desires to understand what his great Creator thus offers him, he is in the proper attitude to receive "the wisdom that is from above" (James 3:17). "The entrance of thy words giveth light" (Psa. 119:130). "If any of you lack wisdom, let him ask of God, that giveth to all men liberally, and upbraideth not; and it shall be given him. But let him ask in faith, nothing wavering" (James 1:5, 6). The soul that truly thirsts for God (Psa. 42:1, 2) and rejoices in His fellowship (1 John 1:3) delights to draw near to Him (James 4:8) and to have undisturbed seasons of communion with Him; "for he will speak peace unto his people" (Psa. 85:8). Of course, the Truth of God's Word is now only for the faith class to understand; and "all men have not faith" (2 Thes. 3:2). The time has not yet come when "the earth shall be full of the knowledge of the LORD, as the waters cover the sea," when no man need to say to his neighbor, Know the LORD: "for they shall all know me, from the least of them unto the greatest of them, saith the LORD" (Isa. 11:9; Jer. 31:34). For many centuries God has been selecting the faith class, Abraham and his seed (Gal. 3:8, 16, 29), for the converting and blessing of the non-elect world of mankind in the incoming Messianic Age. Meanwhile God hides His purposes and plans, His secrets, "from the [worldly] wise and prudent" (1 Cor. 3:19, 20; 1:19) and reveals them unto babes (Matt. 11:25). "God resisteth the proud, and giveth grace to the humble" (James 4:6; 1 Pet. 5:5). Faith is basically essential if one would come to God and learn of Him (James 1:5, 6). "Without faith it is impossible to please him: for he that cometh to God must believe that he is, and that he is a rewarder of them that diligently seek him" (Heb. 11:6). Even if one has this basic faith quality, there are seven other qualities that are especially necessary in order to gain and retain the true understanding of His Word: humility (Matt. 11:25), meekness (Psa. 25:9; Isa. 61:1), reverence (Psa. 25:14), hunger and thirst after righteousness (Matt. 5:6), honesty and goodness (Luke 8:15), and holiness (Heb. 12:14). The study of God's Word will profit us little unless it is "mixed with faith" (Heb. 4:2). Nor can the Truth be gained and retained unless one has the additional necessary qualities. (1) Humility is needed, because it dispels pride—a feeling of self-satisfaction, self-sufficiency, conceit and self-opinionatedness, and causes one to have a proper, lowly self-estimate, whereby he recognizes his own lacks and his need of God, Christ and the wisdom which comes from on high. (2) Meekness is necessary, because it furnishes the teachableness and leadableness of mind and submissiveness of heart that makes one open and responsive to the instructions of God's Word. (3) Reverence is essential, because "the fear [reverence] of the LORD is the beginning of wisdom" … "the beginning of knowledge" (Psa. 111:10: Prov. 1:7), and God reveals His secrets only to those who reverence Him (Psa. 25:14). (4) Hunger and thirst for truth and righteousness—strong yearning for them—is needed to make one's love for these strong enough to overcome the obstacles in the way of his attaining the Truth and its Spirit. (5) Honesty of heart and mind is needed to accept the teachings of God's Word as true, since a dishonest heart naturally impinges against the Truth, while an honest heart has affinity for it. (6) Goodness of heart is needed, because, as like attracts like, a good heart is drawn to that which is good, and the Truth being an expression of God's goodness, a good heart naturally appreciates it. (7) Finally, holiness, a setting apart from the common and ordinary, and a dedication to truth and righteousness, is necessary. Such are the heart and mind qualities necessary in order for one to receive the intended blessing from the Divinely approved method of Bible study. And not only are such qualities needed in order to get the Truth initially, but they are necessary also in order to get it progressively as due to be understood and to retain it after it is received. On the basis of these Scripturally-based qualities, our Lord in His Sermon on the Mount assures us that if we ask we shall receive, that if we seek we shall find, and that if we knock it shall be opened unto us (Matt. 7:7). And now, in the end of the Gospel Age, the Faith Age, in the final, the Laodicean stage of the nominal church (which system He has now rejected and spued out of His mouth—Rev. 3:14-16), He says (v. 20): "Behold, I stand at the door, and knock: if any man hear my voice, and open the door, I will come in to him, and will sup with him, and he with me." Let us, then, open wide the doors of our hearts and minds and let Him come in to feast with us and we with Him. In reverently approaching the study of God's Word we should recognize that its Author is a God of order. Many friends of the Bible, instead of regarding it as containing a system of Truth, look upon it as a compilation of facts, precepts, commandments and promises, that are not capable of being properly arranged. Such people are apt to be weak and vacillating, and at the mercy of the errorist and the unbeliever. Everything that we know about God shows Him to be logical, practical and orderly in every respect. Just as in His great work of creation, "God saw every thing that he had made, and, behold, it was very good" (Gen. 1:31), so in His great plan of salvation for Adam and his race, everything is perfectly arranged and in perfect order for its full accomplishment. And concerning His Word God declares: "It shall not return unto me void, but it shall accomplish that which I please, and it shall prosper in the thing whereto I sent it" (Isa. 55:11). A bold unbeliever in the Bible may find in his "God of Nature" the embodiment of law and order. He sees order in Astronomy, Geology, Biology, Chemistry and other sciences, but only confusion in the Bible, and he rightly reasons that God's works should be orderly and harmonious. He knows the principles of those sciences, and can understand the book of nature, but knows little, if anything, of the plan of the Bible, and therefore cannot understand or appreciate it, so rejects it. But one has as much right to reject Astronomy because he cannot understand it, as he has to reject the Bible for the same reason. What is confusion when not understood, becomes when explained beautiful and harmonious. Until absolute knowledge is gained, each ray of light will at least modify former ideas. To understand any science or book it should be read according to its own principles of interpretation. "No prophecy of the scripture is of any private interpretation" (2 Pet. 1:20). Since God's Word from Genesis to Revelation (2 Tim. 3:16) was recorded and is properly interpreted by the aid of one Spirit (God's holy Spirit—2 Pet. 1:21; 1 Cor. 2:10-14), it should be taken as a whole, and not disconnectedly, thus working disharmony. When we compare Scripture with Scripture, and thus consider the united testimony of the Bible, we learn more and more that "God is His own interpreter, and He will make it plain." It is not reasonable to suppose that God would present to us a series of wonderful books (the 66 books of the Bible) as His written revelation to His people, and yet make them so obscure and difficult as to be impossible for His people to understand them. Everything that God produces is purposeful. Surely His purpose for the Bible would be defeated if He made its message so obscure that with the aid of His Spirit His true and loyal people could not understand it! But many are greatly hindered and confused by the "mumbo-jumbo" of supposedly mystical beliefs which create their own pointless mysteries simply in order to impress others, and many fall victims to the popular assumption that what is wonderful must be inexplicable. Thus many tenaciously hold to more or less mysterious and illogical misconceptions inherited from the creeds of the Dark Ages concerning the nature of God's being and character, Christ's nature, carnation and Ransom-sacrifice, the holy Spirit, the nature of death, the Bible hell, the resurrection, the soul and the spirit, the Millennium, Paradise, the new earth, etc. To rightly understand God's Word, we must be emptied of self, must be humble and meek enough to lay aside creedal beliefs and preconceived notions that conflict with His Word, must reverence His Word rather than the conflicting teachings of men, must have real hunger for the Truth rather than indifference and must exercise faith rather than credulity. Unless we are properly meek toward God and desire to learn from Him, He cannot teach us. We are not to be partial to earthly leaders and their teachings nor prejudiced against any of the true teachings of the Bible; we are not to accept some of its teachings and reject others, holding to only those passages which comfort and please us or which we can use independently of other Scriptures to support our creedal beliefs. If we are not willing to accept the testimony of the whole Word of God, even though some of it may not agree with what others have taught us or with what we have believed in the past or prefer to believe, then we are not ready to come to God to learn of Him. Piecemeal interpretation of the Bible is the cause of much confusion among Christians. It has given rise to the profane proverb that "the Bible is like an old fiddle on which any tune can be played." Very few use much of the Bible; only a few practical precepts, and only enough doctrine to try to prove some particular creed, are valued by the majority. They virtually blame God for giving such a large book when a small one, they think, would have been all-sufficient. The practice of many in teaching is no more consistent than was that of the old man who claimed the Apostle Paul vindicated him in theft. He quoted from Eph. 4:28 as follows: "Let him that stole steal." The words "no more," together with the rest of the verse, did not suit his purpose. Similarly, a preacher who advocated justification by works, rather than justification by faith, took for his text the following words from Rom. 4:4: "To him that worketh is the reward." The perversion will be apparent to all who note the context. We must be careful not to use a text without its context, lest we use it as a pretext. 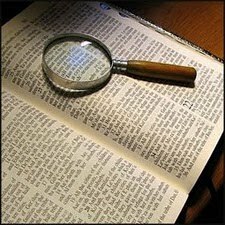 A text is of comparatively little value as proof of a doctrine unless it is understood in harmony with its context and all other texts in the Bible that have a bearing on the same subject, and unless we "rightly divide the word of truth" (2 Tim. 2:15) and assign each text to its proper time and place in God's great Plan of the Ages. The Calvinist, the Arminian and the Universalist may each readily find one or more texts that may seem to sustain his theory; and the infidel will say that the three texts contradict one another. Thus the Calvinist, with his theory of individual predestination to salvation or damnation, may appeal to such texts as Rom. 8:28-30; Eph. 1:5 and Jesus' own words in John 6:44: "No man can come to me, except the Father which hath sent me draw him." The Arminian, on the other hand, holding to the belief that salvation is free to everyone everywhere, may emphasize that "whosoever will" may come and "take the water of life freely" (Rev. 22:17) and that Jesus Himself said (John 12:32): "I, if I be lifted up from the earth, will draw all men unto me." Both of them, though disagreeing with each other on this point, agree that only those who believe in this life can be saved and that all others are eternally and hopelessly lost (though Arminians will often say that God excuses many because of ignorance). The Universalist comes along with such texts as Heb. 2:9; 1 Tim. 2:4-6 and 1 Tim. 4:10, showing that Jesus tasted death "for every man," that God "will have all men to be saved" and that He is "the Savior of all men, specially of those that believe." Each of them stands in his own sectarian corner, defending himself with his own chosen favorite texts. Each will pass lightly over or ignore the proof texts set forth by the others, and so seek to sustain his own theory, despite Bible testimony he cannot harmonize with it. The Bible is true; therefore there must be a way to harmonize all these texts and all other texts in God's Word and not ignore, pass lightly over, or belittle any of them. Surely God does not contradict Himself. Therefore if His Word seems in some ways to contradict itself we may be sure that the fault is with us, not with Him. God has a consistent purpose and a consistent plan for carrying it out. We cannot rightly divide the Word of Truth and thereby apply the various texts to the Ages and Dispensations and the times to which they pertain, unless we understand God's "eternal purpose [Greek, Plan of the Ages—Diaglott; see also A.R.V. ; Rotherham, etc.] which he purposed in Christ Jesus" (Eph. 3:11). While God earnestly desires His people to understand His Plan of the Ages, He does not leave us to flounder in darkness without coming to our assistance. He has graciously provided us with the twelve Apostles, with general prophets or teachers, such as Zwingli, Luther, Wesley, etc., with evangelists, and with local pastors and teachers, "for the perfecting of the saints, for the work of the ministry, for the edifying of the body of Christ: till we all come in the unity of the faith … that we henceforth be no more children, tossed to and fro, and carried about with every wind of doctrine, by the sleight of men, and cunning craftiness, whereby they lie in wait to deceive" (Eph. 4:11-14). Thus we are not left to dig things out of the Bible, every man for himself, with many varying opinions. God has arranged for Truth servants, "overseers" of the flock, both in general and locally (note, e.g., Acts 20:17-31). It is a widely held view that Christians should use the Bible as a textbook, both privately and publicly, and from such study learn the Truth. Thus they treat the Bible as a textbook, and not as a book of texts. The Bible certainly is not a textbook, and therefore should not be treated as such. A little consideration will show this. A textbook is a logical, progressive and orderly treatise on some branch of learning. Any good arithmetic textbook will serve as an illustration. In it the subjects are presented as they logically belong together, systematically, progressively and completely; each line of thought is kept separate and distinct. The subjects are presented so as to progress in each one from the simpler to the more complex, and in their relations so that one leads up to the next. They are never mixed up, but each one follows in its proper order. In these ways the entire subject of arithmetic is presented in such a textbook. The same general course is followed in every other rightly prepared textbook. But the Bible is not so arranged. In no one place in the Bible is everything on any given subject found, let alone discussed in its logical and progressive order. Rather it is treated "here a little, and there a little" (Isa. 28:10). Take any one of its subjects, like God, Christ, the holy Spirit, faith, repentance, justification, man, the ransom, restitution, the soul, the spirit, the wages of sin, the resurrection, etc., and it will be found that it is treated in connection with other subjects, whose subject matter also is given in many scattered places in connection with still other subjects, also presented piecemeal, etc. God has purposely arranged it in this way so as to hide His secrets from those who are proud, conceited, self-sufficient, self-opinionated, "wise and prudent" in their own eyes, and to reveal them to "babes" (Matt. 11:25)—those who are meek and humble and willing to learn from God in His appointed way, i.e., with the help of the Truth teachers that He has appointed for their instruction. Many classes of Bible students feel self-sufficient and ignore the Truth servants God has provided. They use the Bible as a textbook and seek to dig the Truth out of it for themselves, taking up Bible books in turn and studying them chapter by chapter and verse by verse. They are headed for very limited understanding, and for much confusion and disappointment. They often come to as many opinions on the meaning of many verses as there are members in these classes. This demonstrates that the Bible is not a textbook, but a book of more or less scattered, disjointed, enigmatical texts. Likewise, individuals who feel self-sufficient, ignore God's servants and try to dig the Truth out of the Bible for themselves, usually only kindle sparks of error and walk in their light, and therefore will "lie down in sorrow" (Isa. 50:11). During the faith dispensation God through Jesus speaks to the non-faith and disobedient classes in parables and dark sayings, for "to them it is not given … because they seeing see not; and hearing they hear not, neither do they understand" (Matt. 13:10-16). During the world's thousand-year Judgment Day, the books will be opened and the Truth will be revealed to all (Rev. 20:12; 1 Tim. 2:4; Isa. 11:9; Jer. 31:34); but God in mercy now withholds from the world the knowledge of the Truth and the responsibility that such knowledge would bring upon them, until the Day that He has appointed for their judgment (John 12:47, 48; Acts 17:31). Only the faith classes are on trial now (1 Pet. 4:17; 1:7). Since the textbookistic study of the Bible has been proven to result in many conflicting opinions, much confusion and many errors among God's people, it should of course be avoided. In view of this, some may be inclined to give up Bible study altogether and despair of ever understanding the Bible. But this would be to go to the other extreme, for the study of God's Word is enjoined in, and approved by the Bible (John 5:39: Deut. 29:29; 31:10-13; Neh. 8:7, 8; Psa. 1:2; 119:96-100, 103, 105, 140; 147:19; Isa. 8:20; 30:21; Jer. 15:16; Ezek. 3:10; Luke 11:28; Acts 8:28, 30; Rom. 15:4; 2 Tim. 3:15-17; 2 Pet. 3:2; Rev. 1:3). The proper way, then, to study the Bible is to use it, not as a textbook, but topically, as a book of texts, and to look especially to the Divinely appointed Truth teachers for God's people in general, for assistance in the correct understanding. This is the method approved in Acts 17:11 (compare Isa. 8:20; 1 Thes. 5:21; 1 John 4:1-3), where the Bereans are commended as more noble than the Thessalonians, because they listened "with all readiness of mind" to the things preached to them by the Apostle Paul, and searched the Scriptures daily to see whether the things he declared to them were true. Here, then, we have the Divinely approved method of Bible study: (1) one of the pertinent Divinely appointed Truth teachers through whom Jesus speaks the Truth, explains the Word of God, the Truth message due to be understood; (2) good attention with a ready mind is given by the hearers to his presentations, and (3) daily search is made in the Scriptures to see whether these teachings come from, and are in harmony with the Bible as a whole. Thus each one can be "fully persuaded [assured] in his own mind" and "be ready always to give an answer to every man that asketh you a reason for the hope that is in you with meekness and fear [reverence]" (Rom. 14:5; 1 Pet. 3:15). Why is this the correct method of Bible study? Because Jesus, the only true Interpreter of God's Word, gives in New Testament times the Truth as due through His special Truth messengers, even as in Old Testament times God spoke "by the prophets" (Heb. 1:1, 2). The first thing, therefore, that one should do in seeking for a correct understanding of God's Word is to put himself into contact, either directly or indirectly, with the Lord's special Truth messengers. This may be done either knowingly or unknowingly. In the latter instance Jesus manipulates the true-hearted in such a way as to bring them into contact with His special Truth messengers, either personally or in the Truth writings. Thus a Truth message may reach one who is meek, humble and hungry for the Truth, either in the form of a Truth writing—a book, booklet, magazine, tract, etc. — or in the personal ministration of a servant of the Truth. Many Scriptures show that the Lord does not "open the book, and loose the seals thereof" (Rev. 5:2, 5) directly to each one of His people. His Body members were properly organized, in an orderly and efficient arrangement. "Are all apostles? Are all prophets? Are all teachers?" (1 Cor. 12:29). Surely not. God "tempered the body together"; for "the body is not one member, but many"; and "if they were all one member, where were the body?" "But now hath God set the members every one of them in the body, as it hath pleased him" (1 Cor. 12:24, 14, 19, 18). Thus throughout the Gospel Age Jesus has been symbolically walking "in the midst of the seven golden candlesticks," the seven stages of the Church, starting with the Ephesus or Jewish Harvest stage of the Church's history, and ending with the Laodicean stage of the Church, the time in which we are now living, the time of His Second Advent (Rev. 2:1-29; 3:1-22). He is pictured as having "in his right hand seven stars," which He explains as representing "the angels [messengers] of the seven churches" (Rev. 1:16, 20). Each of these stars or light bearers consisted of more than one individual. Thus the star or angel of the Ephesus stage of the Church (which ended in 69 A.D.) consisted of the twelve Apostles; and the star or angel of the Philadelphia, the Reformation, stage of the Church likewise consisted of a number of special servants, through whom Jesus set forth important Reformation truths. Note carefully: In connection with each of the seven stages of the Church, Jesus exhorted, "He that hath an ear, let him hear what the Spirit saith unto the churches" (Rev. 2:7, 11, 17, 29; 3:6, 13, 22). But not once was the initial unfolding of the Truth as it became due given directly to the members of the Church in general. It was always directed to the "angel," the "star," in its own constituency exclusively. In each case it was stated, "Unto the angel of the church in —— write" (Rev. 2:1, 8, 12, 18; 3:1, 7, 14). How careful we should be, then, to look to the Lord and to accept only His Truth teachings as supported by God's Word from Genesis to Revelation, given through His special Truth servants and those who are in harmony with Truth teachings! Well does our Lord warn us to "beware of false prophets" and to "beware of the leaven of the Pharisees [self-righteous sticklers for traditional teachings] and of the Sadducees [deniers of the resurrection and other important Bible doctrines]" of our day (Matt. 7:15; 16:6). "Beware lest any man spoil you through philosophy and vain deceit, after the tradition of men, after the rudiments of the world, and not after Christ" (Col. 2:8). It will help us to avoid error and the many vagaries of teachers of error if we keep in mind the seven axioms or criterions whereby the truth or error on any religious subject can readily be recognized. A teaching to be true must be harmonious (1) with itself, (2) with every Scripture passage, (3) with every Scripture doctrine, (4) with God's character, (5) with the Ransom, (6) with facts, and (7) with the purpose of God's Plan of the Ages. The true, sincere Christian can with the help of these seven axioms readily recognize the many errors that are presented to him for acceptance, and so not waste valuable time on them, but cast them aside. As a basic help in the understanding of God's Word and His wonderful Plan of salvation for the Church and for the world of mankind in general (which harmonizes, e.g., the doctrines of election and free grace), we recommend especially the book entitled "The Divine Plan of the Ages." It is a "best seller"—over 10 million copies have been circulated. It is written in simple language, from a non-sectarian standpoint. It is based strictly on the teachings of the Bible itself and is a veritable Bible key that unlocks its mysteries and enables one to "rightly divide the Word of Truth" with understanding. We publish this valuable 424-page book and supply it postpaid to any part of the world for considerably below cost. For those unable to pay in full or in part, on request we will gladly send helps for Bible study free of charge. None of the Lord's dear sheep should go hungry for the lack of His "green pastures" (Psa. 23:1-6; Phil. 4:19). The Bible! There it stands! But still its truth expands. And cynics scoff in pride. And still the Bible stands.